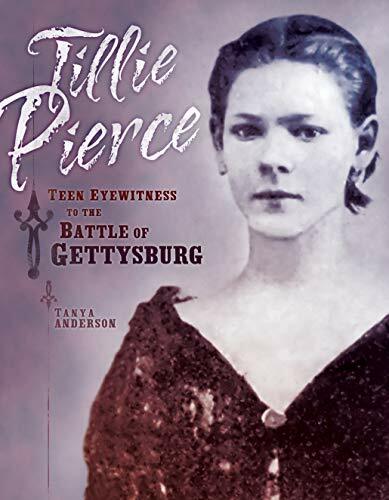 There have been so many books written about the Civil War it seems unlikely that another account could breathe new life upon the subject, yet author Tanya Anderson does just that in her new nonfiction historical, Tillie Pierce: Teen Eyewitness to the Battle of Gettysburg. Tillie is a typical 15 year old living in the bustling town of Gettysburg, a “crossroads town” that travelers must pass through to get to bigger and more exciting cities. Tillie passes tranquil, often uneventful days as a mid-1800s teen, sewing, cooking, and cleaning house, and even her school subjects center around what she considers mundane disciplines like needlecraft and etiquette. Her first taste of excitement occurs when wild rumors circulate that war is coming and bringing with it unruly Rebel soldiers who steal horses and cattle, destroy homes and buildings, confiscate food, and carry off property that is not theirs. Suddenly, Gettysburg is not the same. The younger men run off to join the army, leaving the elderly male residents to arm themselves with the only things they can find to fight the Confederates: axes, pitch forks and rusty guns. Unfortunately, nothing can prepare the townspeople for the first wave of Confederates that flood in, raiding homes and churches and cursing shamefully before they move on. The dust has hardly settled before tens of thousands of Union soldiers march through town after them, and it is only then that Tillie realizes Gettysburg is right in the middle of the fighting. As shells and bombs explode around them, Tillie, her nextdoor neighbor, and the neighbor’s daughters flee on foot to a home in the country where they believe they will be safer. They run through mud, dodge speeding horse-and-buggy ambulances, and watch as men are tossed high into the air by exploding cannon balls. Just like a page out of Gone with the Wind, Tillie Pierce sees screaming, crying, and dying soldiers in the yard, piled into the barn, and overflowing in the house. And though she is almost paralyzed with fear, she finds herself talking with them and offering comfort as she and the others wait for the awful war to end. Although there is no way to escape the long descriptive passages about the battle, the players and the strategic importance of the town of Gettysburg, Ms. Anderson manages to keep tedium at bay by cleverly weaving in portions of Tillie’s harrowing first-hand accounts to the violence and devastation. The illustrations—many by well-known Civil War photographer Matthew Brady—are a mixture of real-life photos, sketches, and paintings, and include pictures of war horses, amputation instruments, and even unburied bodies on the Civil War battlefield. Although no target age is specified for this book, the subject matter, passage length, vocabulary, and factual foundation of the story suggest that the book may be better suited for older audiences, perhaps middle grade to young adult. This story will fare well in Social Studies, Citizenship, and History classes, is a perfect choice for biography papers during Women’s History Month, and may even be used for advanced independent readers.